Talk about dark, darker, darkest! And rich. So rich! Richer than you know who,who is hugely rich. It’s the incredible Creme Brulee, an imperial milk stout from Southern Tier Brewery. Just as Creme Brulee (burnt cream) is a most incredible dessert, this is a most incredible dessert beer. It’s all here – thick, dark, burnt creamy liquid blissedness. Each sip results in an ecstatic response, complete with shivery spine. Is that a tear rolling down my cheek? The experience begins with an undeniably sweet and enticing burnt vanilla aroma, just like the famous dessert of the same name. And then I close my eyes in anticipation of the heavenly nectar I am about to pour into my grateful mouth. It has a stupefying effect. I can’t do anything but think about how amazing this beer is in every way – the taste, the mouthfeel, the stickiness, the sheer silky voluptuousness. You can almost feel yourself crunching through a piece of the hard crust of the namesake dessert, with sweet, burnt flavors smearing across your palate. And, yet, there is a distinct but subtle hop presence. Four malts, two hop varieties, vanilla beans and lactose sugar are used to make this 10-percent beauty. I paired mine with a perfectly ripe Bosc pear. The brewery suggests making a vanilla bean ice cream float with the stout, which sounds good enough to try. 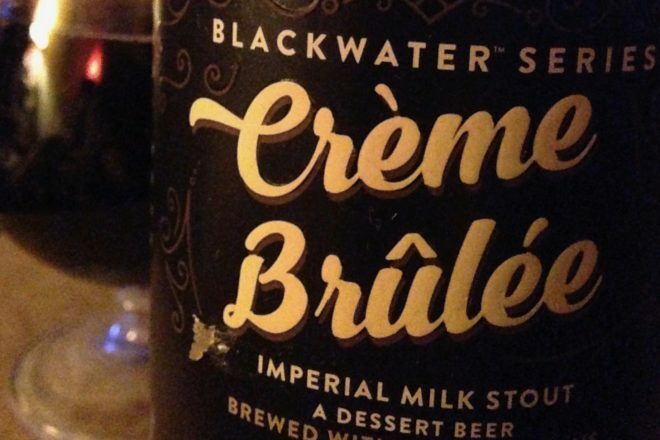 Creme Brulee is an offering in Southern Tier’s Blackwater Series, which has included other delicious-sounding dessert beers such as an imperial stout brewed with mint and chocolate called Thick Mint, Choklat, Choklat Orange and Salted Caramel. I will keep my eyes peeled for bottles of each of those. The Thick Mint is particularly intriguing because I’ve yet to find a minted beer that I like, and I have yet to be disappointed by Southern Tier beers.